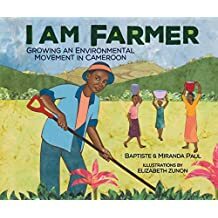 I Am Farmer: Growing an Environmental Movement in Cameroon, written by Miranda Paul and Baptiste Paul and illustrated by Elizabeth Zunon, is a non-fiction account of environmental activism in Cameroon told through the story of farmer and activist Tantoh Nforba who works to bring organic gardening and clean water to Cameroon. Tantoh is introduced as a young boy delighting in his grandmother’s garden. Sensual images and detailed descriptions of the land, and the vegetables that grow from it, pair brilliantly. The authors work the language of nature into much of the story. Tantoh remains committed to learning about the earth in high school. His classmates nickname him “Farmer.” Miranda and Baptiste write: “It is not a nice name. It is a name that is meant to make him feel as low as the dirt beneath his feet.” But, it doesn’t have the intended effect on Tantoh who reveres the dirt. He claims the title, scrolling it in large letters on his school uniform. Tantoh’s father gave him his first shovel and supported his love for the earth. However, his father passed away while Tantoh was still in high school and his brother became head of the house. Because farming was associated with poverty, Tantoh’s brother wanted him to study and get a more prestigious office job. Tantoh stubbornly writes the wrong answers on exams so he will be unable to qualify for the positions his brother has in mind. After high school Tantoh farms the land, eventually going to college where he studies the environment and agriculture. While at college, Tantoh contracts typhoid after drinking contaminated water. It takes him seven years to recover. After his long and frightening illness, Tantoh is committed to ensuring his community has access to clean water. He gets the opportunity to study in the US and pursues this goal. Upon returning to Cameroon, and with the help of community members, Tantoh creates botanical and rain gardens as well as springs that provide fresh drinking water. Tantoh then created an organization called Save Your Future Association, to raise money for equipment to help with his work. He has taken on numerous increasingly large projects to bring clean water and healthy food to the people of Cameroon. I Am Farmer: Growing an Environmental Movement in Cameroon will make a wonderful addition to personal and school libraries. It can be taught as part of lesson plans about biography, environmentalism and science, geography, or cultural diversity. It does a lot of work! Miranda Paul and Baptiste Paul do a great job balancing detail without being too text heavy. Thoughtful and engaging back matter concludes the book will extend the text’s lessons beyond the story itself. *I received a digital book through NetGalley to write a review.